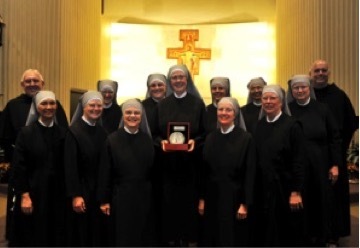 On October 10, the Little Sisters of the Poor received the Franciscan University of Steubenville’s Poverello Medal at a ceremony in the school’s Christ the King Chapel. The medal was awarded to the Congregation for their “dedication to the poor and elderly” and “courageous stand for Catholic values and religious freedom despite challenges from government authorities.”The Poverello Medal is Steubenville University's highest non-academic honor. It is bestowed upon organizations and individuals who imitate St. Francis of Assisi - "Il Poverello", or the little poor man - by their strength of character, practical Christian charity, and love and service to the poor.